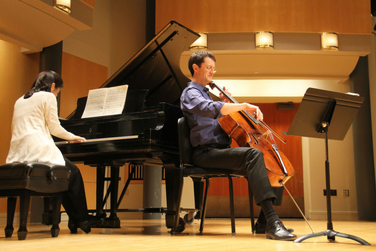 Faculty member Eric Kutz, cello, joins duo partner Miko Kominami, piano, for an evening of French music: suave, sultry and sensuous! The program will include Maurice Ravel's last composition, written for a film version of Don Quixote from which Ravel was fired and Francis Poulenc's Sonate, a piece begun in 1940 and halted by World War II. Sonate was finally completed in 1948 at the behest of French cellist Pierre Fournier. Rather than a reflection of war’s horror, the piece is a jubilant celebration of peace.